Yo‐ho‐ho! 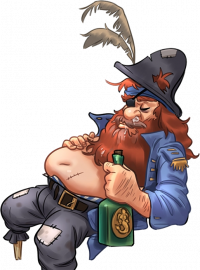 A wooden leg, an eye patch and a bottle of rum in the left hand — Admiral Sploosh is a pirate, or rather, what's left of it. His beard and red hair follow the rhythm of his snoring. Although still wearing his old blue navy uniform, he exposes his generous belly to the public. His pants, patched and worn out, are in the same condition as the bicorne he wears on his head. Sploosh came out of nowhere overnight, and made the pier his new home. Never short of liquor, he rarely emerges from his intoxication.